One of the reasons you got a family dog was the enticing thought of outings - to the pub, the cafe, the beach, forest parks … What could be nicer than enjoying a walk in beautiful scenery, and ending the visit in congenial surroundings with everyone tucking in to good food and drink? But the reality arrived in your fluffy bundle of puppyness, and you soon discovered that your family dog had other ideas about how life should work! So you may have a dog who’s ebullient, boisterous, loves everyone, and you feel you can’t inflict that on a pubful of people wanting a peaceful refreshment stop. Or maybe your dog is reactive - shy, anxious, “aggressive” - and struggles to be in the same space as strange people and - worse - their strange dogs. Your ideas of family outings with your dog have been put on hold for an indefinite period, until … until what? Until he gets to age 11 and calms down a bit? Until he suddenly decides he’s no longer afraid of people and dogs? Until he’s able to pass a dog on the path without a meltdown? You could be waiting a long time! So let’s speed this up - a lot. One game all dogs should learn is how to relax on their mat. Once your dog knows that if the mat is on the floor, then he should be on it, calmly waiting for you to reward him for staying there, then you can consider going out to places. I can’t tell you the number of students who have found this skill so useful - at home, when friends visit, in cafes, on trains, on buses, at training class, on holiday, at the shops, at friends’ houses, at the vet’s - the list is endless. If you’re starting with a puppy, so much the better. This can all be part of her valuable socialisation program. “We thought about delaying getting our new German Shepherd puppy because we had already arranged a short holiday with friends. Our breeder persuaded us that we shouldn’t wait and that a holiday was an ideal time to have our puppy bond with us. So we collected our 8 week old puppy and spent 2 weeks getting to know one another, then headed off with our friends by car and then ferry to the Isle of Skye. Before she was 11 weeks old, puppy Elva had been in the car, on a train, and on a ferry - and she took it all in her stride. People might worry about meeting enough people in the important socialisation phase in a puppy’s life but everywhere we went, she was a people-magnet with everyone wanting to pet her. She loved all the attention and we loved that she was interacting with so many people! And Ellen travelled a lot with her Border Collie pup Selkie, even at only four months! “The games have helped greatly with making puppy trips easier and laying the foundations of good communication. She's particularly great on her mat on buses, trains and in pubs! So matwork will get you part of the way there - and may be all you need for your excitable dog. You also have to make life as easy as possible for your worried dog. And the most important thing for your reactive dog is distance. So a good place to start would be an establishment with a large, open, garden where you can get away from other people and be out of their way. If you go to a crowded place and your dog surprises you by being “fine” with all the busyness, think again. It’s more likely that your dog is exhibiting a learned helplessness - he can’t escape, it’s all too stressful, so he shuts down and waits for it all to be over. 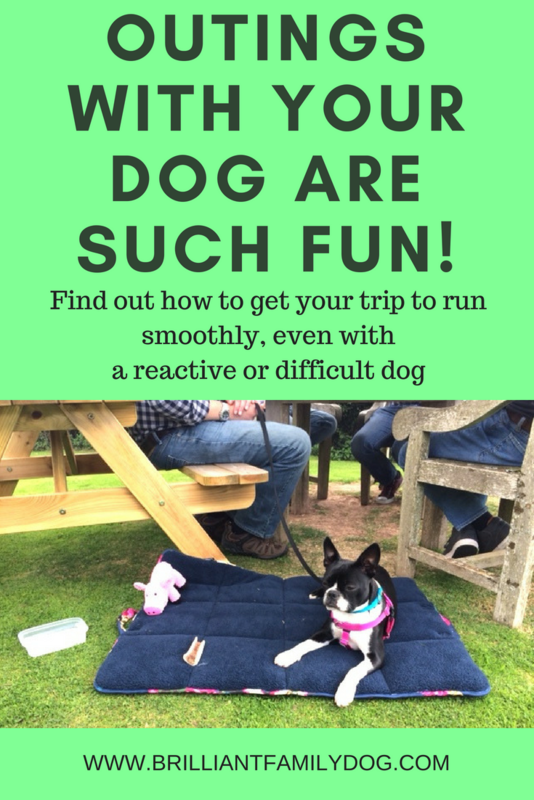 So heading off on this type of outing can only be done when you know there’s a good chance that with all your preparatory training, your dog will be able to cope. Either way, you need to plan this trip! “We had aimed to go to the pub today and had it planned out to the letter. If either of the dogs got too stressed we wouldn’t stay for lunch, just a drink. We plotted the route yesterday. Later the dogs enjoyed more of their river walk and a swim. They couldn’t have had such fun from the day without the thought Kerina and her sister put into it. It didn’t take much to take all this stuff with them - think how much a toddler’s family has to pack for a couple of hours! - but it paid off many times over. An important part of Kerina’s plan was to abort the trip if things weren’t going well. Always be ready to get out of Dodge. If your dog is stressed it’s not going to be much fun for any of you. And if your dog’s having an exciting walk, with lots of running and sniffing, be sure to factor in plenty of downtime. That’s when those prepared foodtoys and the mat come into their own. So get everything ready, do all the training first, plan a trip, plan your exit strategy, and enjoy the family outings you were so looking forward to when you decided to get a dog to share your life. You’ll find a week’s worth of tips for calm walks and outings here in this free Workshop!